Finishing up the series on Black Forest Bison is this "Double Black Diamond" variety, essentially the company's black peppered flavor. See my previous reviews of their Tombstone Teriyaki, Caliente Canyon, Rocky Mountain Red, and Gunsmoke varieties. Black Forest Bison is a family run bison ranch located outside of Colorado Springs, CO. They raise grass-fed bison, use no hormones, steroids, or antibiotics. They sell steaks, chops, roasts, sausage, and jerky. 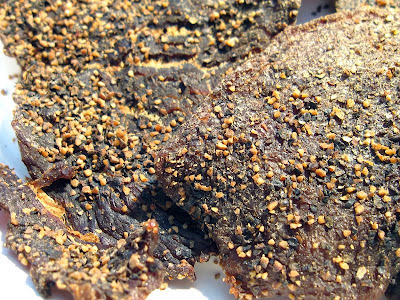 This Double Black Diamond was the 2nd place winner in the "Best Jerky" contest at the 2007 Fiery Foods Challenge in Ft Worth, Texas. Black Forest Bison has won awards for its other varieties as well. Bison, soy sauce, water, worcestershire sauce, herbs & spices. The soy sauce and herbs & spices are noted as being all organic ingredients. The company mentions there's a blend of white, red and black pepper in this. The first thing I taste from the surface of these pieces is a smoky flavor, with a slight saltiness, and a light peppery flavor. Overall, the surface flavor has a medium level intensity. In the chewing, I get a soy sauce flavor, with a worcestershire flavor mixed in. There's a stronger saltiness here, while the pepper blend builds a light burn on the tongue, and strong aftertaste. The taste of this jerky seems quite comparable to the company's Gunsmoke variety, except this has the peppery bite and aftertaste. For being described as a peppery variety, this definitely has a strong peppery flavor. I can taste the black pepper quite well, but I also get a burn from the red pepper. The heat generated from the pepper blend seems to rate around "medium" on my hot scale. I can feel a little warming of the blood, and the eyes are slightly misty. But I think the primary flavor of this jerky is still the combination of soy sauce and worcestershire sauce. It seems to be the flavor I notice more all throughout the chewing. The pepper blend is a close second, still being quite strong. The soy sauce and worcestershire seems to dominate most of the palate, while the pepper blend is strongest in the back of my mouth. But another reason why I think the soy sauce and worcestershire combo is still the stronger flavor is the saltiness. The salt intensity seems rather strong in this jerky, and that tends to overpower the spicy bite of the pepper blend. The natural meat flavors are very light. It's light enough that I don't notice it all when snacking away; I only notice it when I analyze carefully at what I'm tasting, and even then it's very light. Overall, the flavor this jerky offers is the combination of soy sauce and worcestershire sauce, with a strong saltiness, and a strong blend of red, white, and black pepper. This is a dry jerky, but where the pieces have a good deal of flexibility. Tearing pieces apart with my fingers seems easy to do, and chewing seems easy as well. The chewing texture starts out feeling dry, yet soft, and with some light biting and sucking, it seems to chew down to a soft mass easily enough in about 15-20 seconds. At that point, it feels pretty much like a steak, perhaps cooked well. I find no gummy, mushy, or crumbly texture at all. The pieces all seem to be quite lean, with little fat visible. I didn't encounter any gristle or tendon, but I did encounter quite a bit of chewy, stringy sinews, some of which remained in my mouth as unchewable wads. In terms of clean eating, the liberal spread of pepper on this tends to fly off as I tear pieces apart, and my fingers pick up bits of pepper as well. 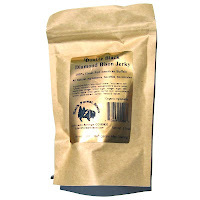 Black Forest Bison sells this Double Black Diamond variety online at a price of $11.00 for a 3.5oz package. If you were to purchase 3 packages (each a different variety), the shipping costs would amount to $10.50 (if sent to my home town). That works out to a total price of $43.50, or a per ounce price of $4.14. For general jerky snacking purposes, at the $4.14 price per ounce, this jerky seems to provide a weak value. I do get a good deal of snackability out of this through its strong flavor and great meat consistency, but the price of this is very high for jerky in general. It's a good jerky, but there's a lot of other good jerky brands that can equally satisfy for much less. As a peppered jerky, at the same $4.14 price per ounce, it's a weak value as well. You actually do get a lot of peppery flavor in this, which will easily satisfy lovers of peppered jerky, but again, the price of this is so high, there are other brands that offer as much peppery goodness, at a lower price. It's really with folks who want bison jerky, specifically grass-fed bison, with no hormones, antibiotics, and steroids, where this jerky offers some value. But even as a jerky aficionado, I don't taste any natural meat flavors in this. If I were to buy bison jerky, I want the flavor of bison. As it is, I'm only getting the flavor of soy sauce, worcestershire, salt, and pepper. This Double Black Diamond variety from Black Forest Bison offers a great deal of peppery flavor, and even some peppery burn, in a pretty good meat consistency that's easy to tear apart, easy to chew, and chews just like a piece of real meat. But I don't pick up any natural meat flavors, nothing that let's me enjoy the flavor of all natural, grass-fed bison. Instead, I'm tasting a blend of soy sauce and worcestershire sauce, with a great deal of pepper. But overall, it's still a good tasting jerky, with a good meat consistency and chewing texture, and lot's of chewing flavor. 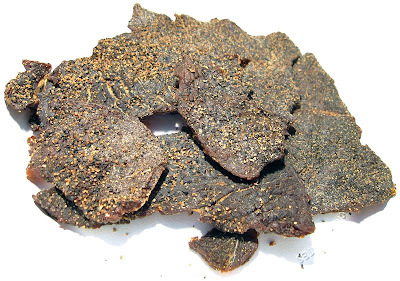 Folks who love peppered jerky will particularly enjoy the blend of black, white, and red pepper. For recommended beer pairing, I'd go with a heavy bodied stout or porter.